I confess that I am a person of order and structure. I have always thought that I would have thrived in the military with its rules, expectations and order. I try to break from the comfort of this at times and do unexpected things and be adventurous, but at times I find that I am easily frustrated when things break from the norm or do not go as planned. I stopped to really consider this after I heard a quote this weekend while watching College Game Day on ESPN. I didn't catch the guy's name, but the commentators were talking about all the upsets so far this year in college football. The guy said, "If everything always went as planned, we'd all die of boredom." Well said! 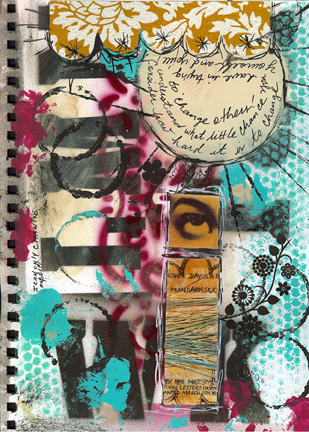 Journal Page Elements: Acrylics, stencils, glaze, black pen, spray paint, wallpaper, rub-ons, rubber stamps and collage element from Teesha Moore. Daily Journal Prompt: Would you rather lose 1/3 of each of your senses or lose one sense entirely?